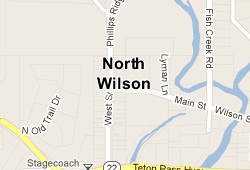 Located in the northwest corner of Wyoming, North Wilson is a part of the small, upscale community of Wilson. The town, home to around 1,400 permanent residents, sits at Teton Pass, about 12 miles away from the much-larger city of Jackson. The town of Wilson, founded in 1889, bears the name of Elijah Nicholas Wilson, a former Pony Express rider and one of the first Europeans to settle here. The area is noted for its large properties with dramatic mountain and meadow views, its proximity to national parks and its four seasons of outdoor activities, including skiing and hiking at nearby Jackson Hole Mountain. Despite its small size, Wilson is home to a diverse collection of shops and restaurants. Owners of North Wilson, Wyoming real estate will find fresh produce, fresh baked goods, meat cut to order and a variety of prepared foods at Aspens Market in Wilson. For household items, Hungry Jack's General Store offers an eclectic mixture of clothes, hardware and housewares. Restaurants in Wilson are generally casual and locally-owned. (You won't find a chain restaurant in this corner of Wyoming.) Popular eateries include Sudachi, for innovative Japanese cuisine and sushi, the dining room at Teton Pines Country Club for progressive American cuisine in a cozy setting with an outdoor patio in the summer and wood-burning fireplaces in the winter, and Q Roadhouse, a rustic bar/restaurant noted for its casual American cuisine. One of the best things about North Wilson, Wyoming real estate is the abundance of nearby outdoor recreational opportunities. Few places in the United States offer such a variety of four season outdoor activities. Three ski areas are nearby, including Jackson Hole Mountain, the largest and most popular of Wyoming's ski resorts. Just north of Wilson is Grand Teton National Park, 310,000-acres of wilderness and wildlife, with hiking trails, rock climbing, recreational lakes and cross-country ski trails. Yellowstone National Park is just 60 miles to the north. Fly fishing along the Snake River, located adjacent to Wilson, is excellent, and golfing enthusiasts will find more than a dozen challenging courses in and around Wilson, including the 18-hole, Arnold Palmer-designed course at Teton Pines Resort. Most golf courses in the area are highlighted by dramatic backdrop of the Teton Mountains. North Wilson, Wyoming real estate is largely upscale, with the average home sales price in 2011 hovering at $781,875. Most of the properties here are large, multi-acre expanses, many with barns and/or stables. The views here, of the Teton Mountains and alpine meadows, are some of the most sought-after in the United States. North Wilson, Wyoming real estate ranges in style from luxury log houses to lavish, multi-million-dollar estates. Many properties in this area include access to the local equestrian center and/or have creeks running through them for fly fishing. School age children in North Wilson attend the schools of the Teton County School District. The district, with an enrollment of around 2,300 students, operates six elementary schools, one middle school and two high schools. The school district is understandably proud of its nearly 93 percent graduation rate. Jackson Hole Community School, a private college-prep school, is located in nearby Jackson. Jackson is also home to a branch of the University of Wyoming. Within Wilson, Wilson Medical Clinic provides residents with an array of outpatient services, including sports medicine and orthopedics. Additional medical services are available in Jackson at St. John's Medical Center a 108-bed hospital with adjacent doctors' offices and a wellness clinic. You're never very far from shopping, dining or outdoor activities in Wilson. For trips out of town, the Teton Pass highway and SR 89 connect Wilson with Jackson, Wyoming. The ski areas also provide transportation to and from their mountains. If you're headed out of state, Jackson Hole Airport, a 533-acre facility located inside Grand Teton National Park, is within a 30 minute drive of Wilson. This airport serves more than 30,000 passengers annually, and offers non-stop flights to Denver, Chicago, Salt Lake City and Atlanta. If you are thinking about buying or selling a home, give us a call at (307) 690-6906 or send us an email to explore your options and to find out when is the best time for you to make a move.